If you’ve ever been in a situation similar to mine where you have multiple computers, one Ethernet cable and no wireless router then don’t sweat it. You’re still in luck! 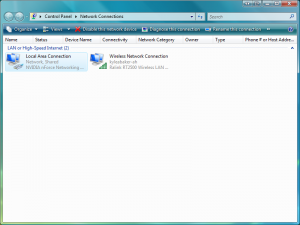 If one of your computers has at least two network cards, for example an Ethernet port and wireless capabilities, then you can connect one computer via the Ethernet connection and broadcast that same connection over that computer’s wireless card so that other computers can connect. I’ll show you how below. 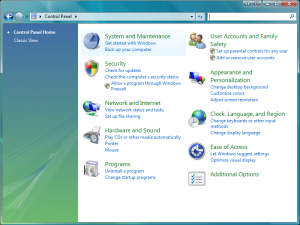 I will be walking through the steps in Windows Vista, but the steps should be the same across all platforms. If you’re using a different platform then just try to find the same dialogs and options on that system and everything should work fine. 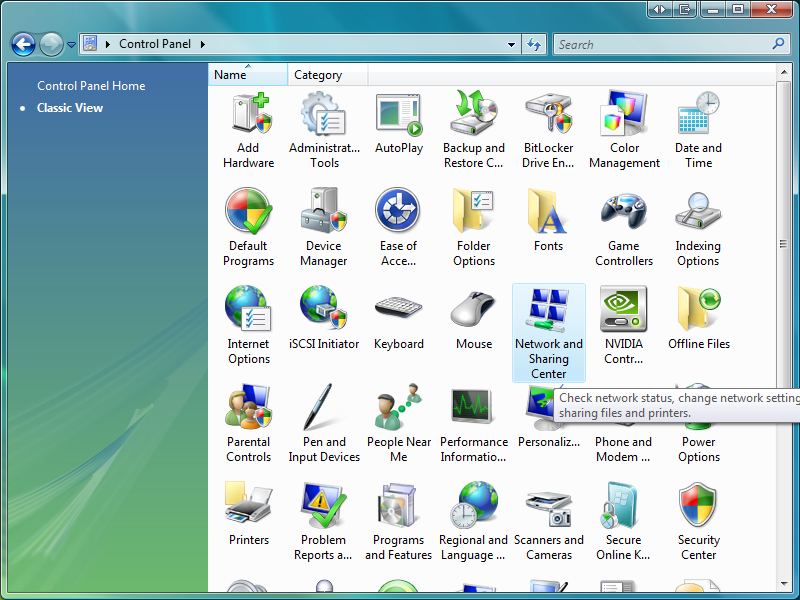 In the image above, the icon for “Network and Sharing Center” is selected. Double click on this option. When the window changes you should see a list of tasks in the left column. 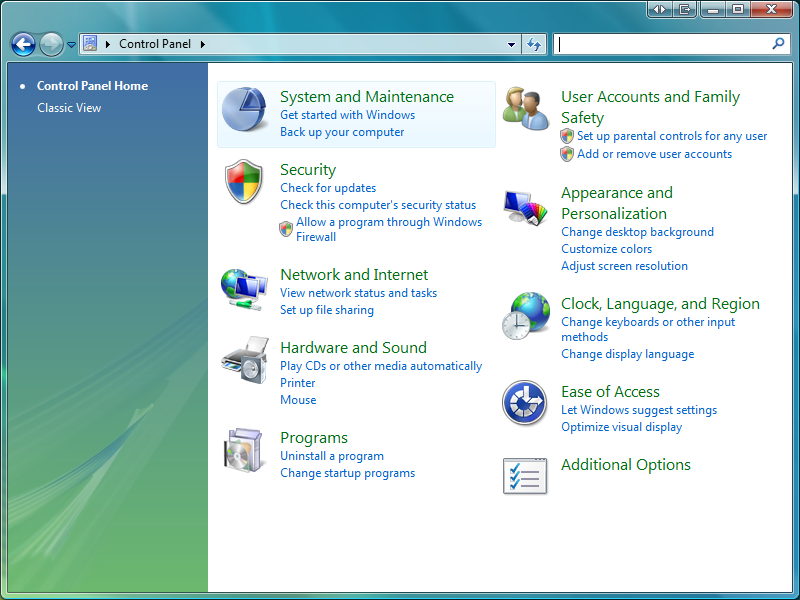 Click on the item from the list labeled “Manage network connections“. 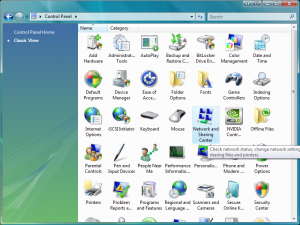 This will open a new window that should show the network cards available on your computer. Make sure that your Ethernet cable is plugged into your computer and your Internet source and that the Internet connection is working fine on that computer. Now right click on the option labeled “Local Area Connection” and select “Properties” from the menu (User Account Control will most likely ask you if you wish to continue and just agree and click continue if it does). The Properties window will open on a tab labeled “Networking” with a list of items that the connection uses. Just ignore all of that and switch to the tab labeled “Sharing.” The options on the “Sharing” tab should be selected as follows. 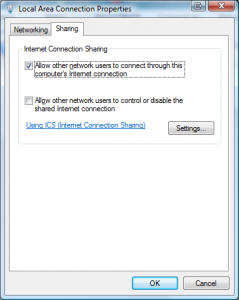 Enable the option labeled “Allow other network users to connect through this computer’s Internet connection.” Disable the option labeled “Allow other network users to control or disable the shared Internet connection.” After matching these settings, click “OK” to save the changes. You need to give the network that you are creating a name that you will be able to recognize and it can be anything that you want! 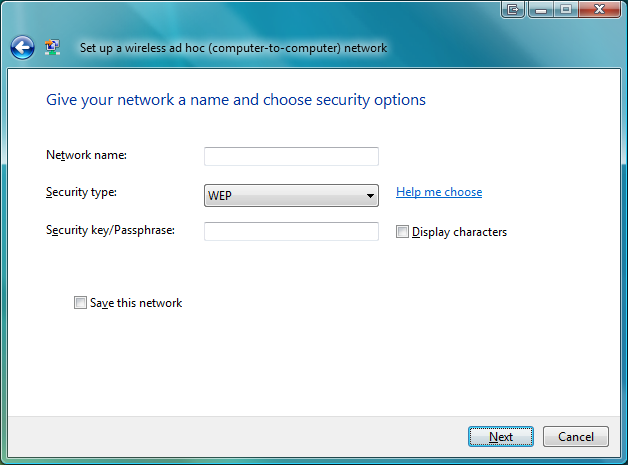 You also have the option to add security to your network. 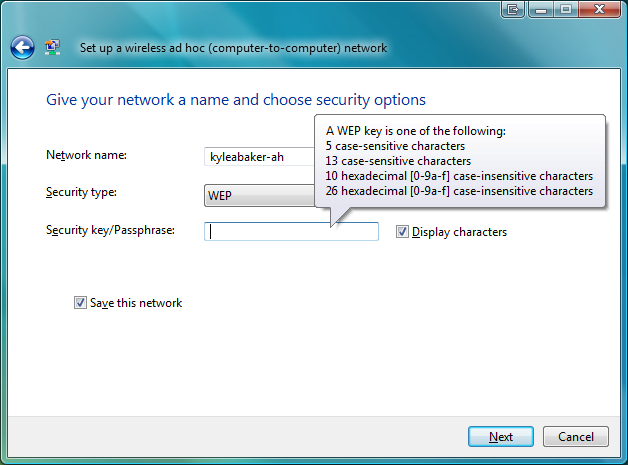 I highly advise this as you have more control over your network, so just select the option for “WEP” and below it enter some form of a password. You can click the option to “Display characters” while you are entering the key/passphrase. 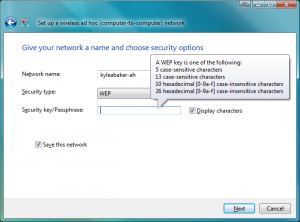 This will make it easier to make a new key for your network. Don’t forget to also enable the option to “Save this network” if you plan on using it later! If you hover the text box for the key/passphrase, you will see a notification tooltip that explains how the passwords work. You should follow those instructions to create your password and make sure it is the correct length as specified in the tooltip. Click “Next” to complete the setup and close any open windows. 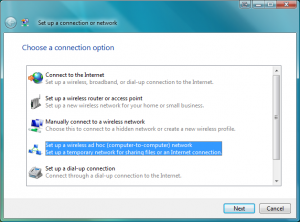 Your Ad-Hoc network is now setup and you should now be able to see a wireless signal on your other computers. Connecting to your network will require the users to know the key/passphrase that you entered, but once connected..all of the other computers should be able to browse the web and connect to instant messengers…anything you need! If you have any questions then please ask them in the comments! Just remember to follow the steps closely before asking. Enjoy! sir i am satisfied with your expination about the network sharing.here you have explained about sharing of network in vista.but i need to know about xp.so please tell me about.and also please tell me can we use switch for this purpose,insted of routers.if what are the steps we need to follow. I have followed the steps but the problem is that my Vista laptop broadcasts the Wireless signal of my ADSL Connection to my XP PC. It has worked but then it has stopped. The XP PC says it is connected but the internet does not work. Firefox and IE alike show “Page Cannot Be Displayed”. Any ideas? I’ve noticed the same thing. Just try disconnecting and reconnecting. From what i can tell, that fixed that problem here. Make sure you followed step #4 correctly. It sounds like you setup the wireless connection from the host computer, but forgot to first make sure to share the Internet connection through the signal. I have two laptops one of which is connected directly to the internet via LAN cable. One’s using Vista and the other one xp. There’s no other free port left to connect the other laptop to the main one (the one that is connected to the internet). Therefore, I have lately bought a switch which enables the connection between both laptops. I have not tried to connect them yet because I still need either an extra cross-over or a straight cable whose one end is to be plugged into the switch and the other end connects it to the second laptop. The question is however, whether or not the second laptop will be able to share the internet with the main one without the need of a separate ip, other configurations based on the provider,.. Or basically how do I get all this working properly?! I live in a dormitory and the internet connection is restricted. It takes a certain amount of time to have one’s computer registered in the network in order to be able to access the internet. Any help, hints, suggestions will be deeply appreciated. Hi! 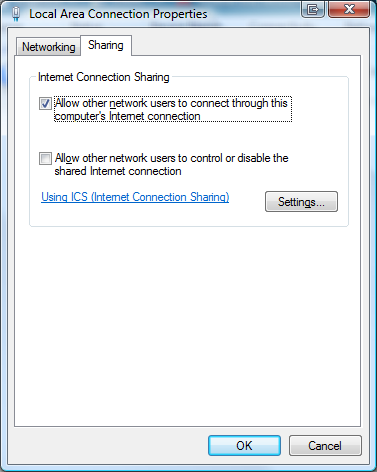 Thank you for the tutorial, however, I have a windows Vista computer and when I click “ok” to save the sharing changes it says “An error occured while internet connection sharing was being enabled”, please help. Did you actually test this technique with more than 2 computers? I have used it several times in hotel rooms while travelling with 2 laptops, but today I tried with a third one, and never managed. It will connect, or rather look connected, but cannot even ping the sharing laptop. I repaired both connections, restarted the sharing, etc to no avail. Another laptop gave the same result. 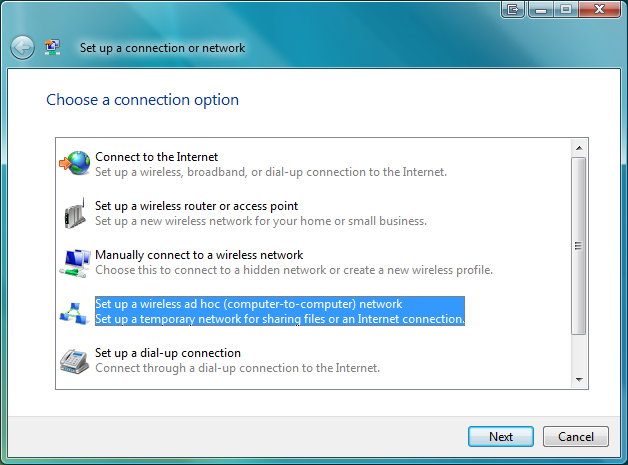 I am not having option “Setup a wireless ad hoc (computer-to-computer) network” on my desktop PC. Please guide me how to get this option. hi! can you please give me some help? i want to multiple my network, that’s why i bought a router and hub.my problem is; i can’t connect to the internet if i connect the cable from router to hub, but i can connect to the internet if i connect the cable from router directly to computer. is there any configuration that i need to do? I have 10 computers and each has a bluetooth device installed. When connecting all these computer to one with internet connection (server), is it possible to extablish the connection among these computers using just a bluetooth device or will i need something like a router to do that?